You've most likely enjoyed cacio e pepe (meaning "cheese and pepper") on spaghetti, but the super simple and tasty pasta topping can be used on almost anything, including plain ol' potato chips. This is one of those snacks that's much greater than the sum of its three parts. 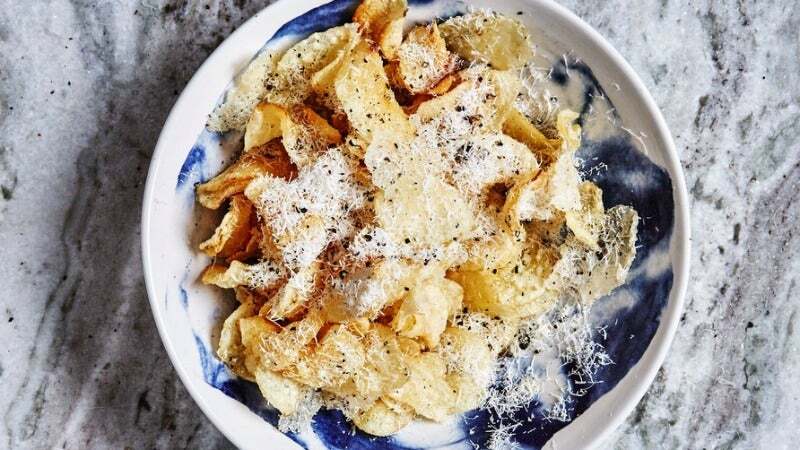 All you have to do is grate some Pecorino over store-bought kettle chips, pop 'em in the oven at 220C until the cheese is browned on the edges, grate more cheese over that and top it all with freshly ground pepper. The resulting plate of cheesy, peppery goodness will feel more special than eating chips straight out of the bag, while only taking about five minutes to prepare from start to finish.